A very good screenplay, competently filmed, about complex characters moved by personal and sociohistorical forces they struggle to control. Between Anna's tender bourgeois girl and Henrik's tormented priest, we can see the formative elements of Bergman's own personality, to which is added Henrik's bitter class-resentment, portrayed essentially as a man fundamentally incapable of making a good decision: whose side Bergman was on is not much of a mystery. Far superior to most period dramas. I wish I'd been aware that August and Bergman's Palme D'or winner was a cut down version of a mini-series that was almost twice as long. Had I known, I definitely would have wanted to watch that instead. Nevertheless, the film treats us to very memorable moments (and some soap opera-ish ones), taking a patient subsequent slices of life approach which transcends traditional script structure by playing out over the course of multiple years, and we get to go on quite a journey with Henrik and Anna. The history of Bergman's parents as the story of Bergman's psyche - yearning for faith in a cold, ambivalent universe, desperately trying to connect with another human being, the highs of love, the lows of separation and selfishness, the conflicts of different generations, the joys, eccentricities and stubbornness of aristocracy, yup there's even a big lavish Christmas. Even better that it was directed by someone who wasn't Bergman himself. Certainly, it's intimidatingly long but it has a cumulative power which results from the deliberate pacing and it occasionally explodes in riveting scenes of confrontation which are pointed, hurtful and overwhelmingly true. I liked the way it was natural. The script is wonderful, Bergman understands people and their relationships like no one else. It makes characters in other movies seem embarassingly incomplete. Bergman's characters change their minds, have violent outbursts followed by tender moments, feel guilt and doubt and pride and shame, and the words they speak are so right. 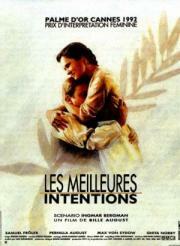 August's direction is more distant than Bergman's, but he does a fine job, getting great performances from the leads.